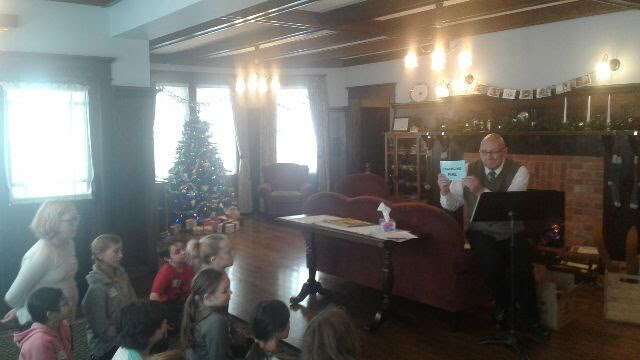 Children learned about radio plays - and got to be the sound effects! Besides the projects in our online unit studies, our art class takes on a festive note as we make decorations for our home and as gifts. This year we are trying out a pattern for homemade Christmas Crackers. Not sure if they'll turn out right but, as Nellie wrote, it's more fun to make our own decorations anyway. Making the decision to homeschool was one that our daughter took very seriously and didn’t jump into quickly. It was something we had talked about for a while since we knew I planned to retire from my 9-to-5 job in the fall of 2015. 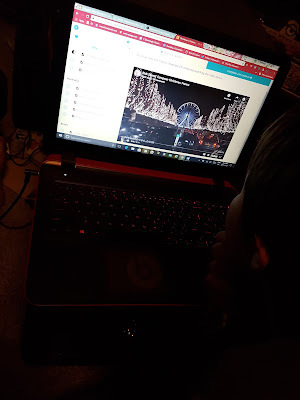 After considering the options and knowing that I would be traveling quite a bit, we decided to begin homeschooling after the Christmas break. One of the things she was most concerned with was socialization. Changing from a daily schedule of before-and-after school care plus full-day school to being an only child who homeschools would be a big change so we wanted to be sure there would be opportunities for interaction with other children. As it turns out, we didn’t need to be overly concerned. With a little research, we’ve been able to find plenty of programs and drop-ins for homeschooled children and families where kids have the chance to work together. An added benefit of my traveling is having the chance to work with children and facilitators from different areas of the U.S. and Canada. Nothing can beat hands-on learning for bringing a subject to life for a child. We try to take advantage of opportunities here at home as well. 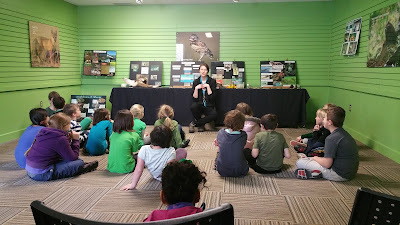 One of our recent ventures was Home School Day at the Calgary Zoo. This program had the advantage of fitting in with the provincial curriculum so we can fit it in easily with the desired learning outcomes. The day started out cold and blustery so we were happy that much of our activities were indoors. The day is organized into a morning and afternoon session by grade group. You can register for one or both, depending on your preference. 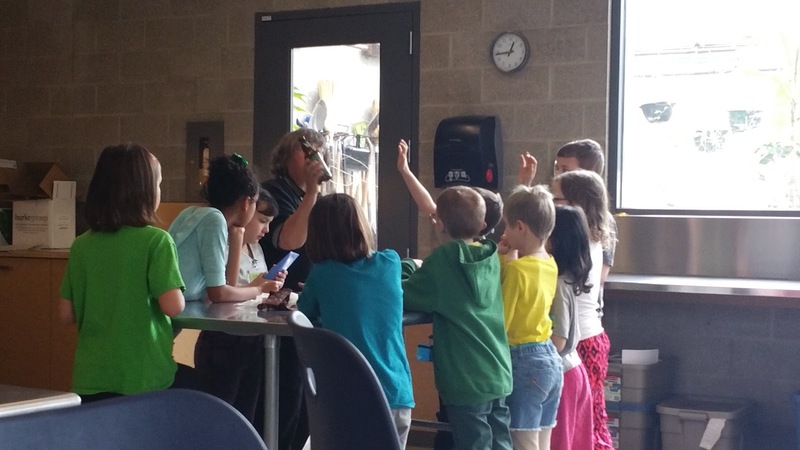 Grades 3 and 4 started the day with "Croak, Lifecycles of the Young & Slimy" where the kids learned about the life cycle of insects, birds, amphibians, and mammals. There were lots of opportunities for the kids to ask questions and participate in the program that ended with a skit for the moms who joined in by creating the "scary" music at the appropriate moments. After a lunch break, we gathered at the Karsten Discovery Centre for the afternoon sessions. This time, grades 3 and 4 would be working in the Conservatory on "Green and Gorgeous" where they learned about plants and botany. They learned about what makes a plant a plant and looked at the many ways the lives of humans and plants intertwine. After identifying several plant species in the Living Garden, the kids tried their hands at sketching their favorite. This was followed by time in the lab where they had the opportunity to dissect a flower and identify its parts. This worked in well with the lifecycle study as well as providing an opportunity to work with a partner. 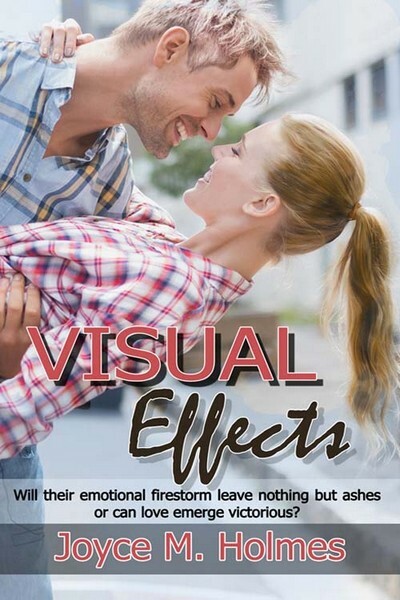 I was immediately drawn to the characters in Joyce Holmes latest romance, Visual Effects. The story begins as Drey starts her new life in Hollywood and meets a handsome, if somewhat reprehensible, man from her past. Will he remember her? This is just one of many questions the reader will have as they travel along with Drey in her new career. Sharing an apartment with her best friend Carly, Drey demonstrates just how good a friend she can be as Carly goes through the ups and downs of romance. Not that Drey is a stranger to heartbreak herself as we find out along the way. Will she continue to shut herself away from love? Or will the right man break through her defences. And Drey isn’t the only one with a past. Her handsome co-worker, Jesse, has a history of his own. As we move through the story, it becomes clear that these two star-crossed lovers will have to overcome a lot before there is even a chance of a happily-ever-after for either of them. Then, just when you think things are getting hot in the romance department, there is yet another twist in the plot to keep things interesting. Will a lover from Drey’s past ruin everything before it has a chance to begin? Bring in additional family members with their own troubles and a proposal for Carly and you have a terrific story that is a must for your summer reading stash. I was recently provided with a preview copy of this book for review. I don't know about you but in my house, I seem to have been elected editor. Whether my girls are working on a post or my husband is putting together a letter for his union position, they inevitably send it to me to "look over." Most of the time this isn't an issue, but there are some days when I just can't squeeze in one more minute on the computer without letting something of my own go by the wayside. I think I may have discovered some help. I've been using the free version of Grammarly for over a year. I find it very handy when I'm working directly on Blogger or for my online classes on D2L. I was recently provided a month of Premium Service for the purpose of this review. I have to tell you I am quite impressed. My husband had just sent me a somewhat technical document so I thought I would put Grammarly to the test. Right away, it flagged over 50 critical issues ranging from errors in verb agreement to problems with spelling. It was quick to scroll through and have Grammarly make the corrections. Much faster than me reading and poking through the whole report and getting frustrated. Now I'm not saying that my husband is a terrible writer but I find a lot of this type of issue can creep into a document with multiple people working on it as it goes through many revisions. Once I had this all done it was relatively easy to edit for readability and understanding. Grammarly even flagged the passive sentences and overused words for me. One of my favorite things about Grammarly is how it explains grammar rules and gives vocabulary enhancement tips. These are helpful for writers of all levels but can be of great assistance to students who are still learning the craft. The plagiarism checker would be handy for all those school reports as well. Before writing this review, I read some of the research provided on the Grammarly site. They have some interesting infographics, including my personal favorite A Grammar and Style Guide to #Yodify Your Language. I've also enjoyed receiving my weekly progress reports from Grammarly. Highlighting various areas of my writing for the week, these reports help pinpoint my most common issues as well as provide writing tips. This feature would make another great addition to a student's writing toolbox. I'm happy to say I recommend this program to all of my friends. We've had our Cricut® machine for about two years now and have had a lot of fun with it. We've made birthday party cupcake holders, party invitations, gift boxes, greeting cards, gift tags and many more projects. Cricut makes it easy and saves countless hours of cramped fingers from cutting out all of the individual pieces! 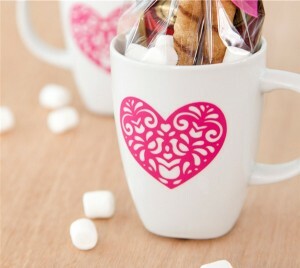 It's perfect for making personalized gifts like this cute coffee mug cut-out too. Now with Cricut's new Access™ subscription, we can have access to over 30,000 images and over 1,000 Make It Now™ projects and 370 fonts. I just love this baby romper project. They're perfect for a baby shower gift. Practical and cute! I love being able to personalize my planners and journals with Cricut Access™ patterns like this one for an important dates project planner. It's so much nicer to make my own than to try and find one that suits my needs in the store. Starting at $7.99 a month, Cricut Access™ members get exclusive benefits, including 10% off all orders on Cricut.com and in Cricut Design Space™. You'll also be the first to access new images, projects, and exclusive designs. This subscription sounds like a terrific deal for people who love to craft. 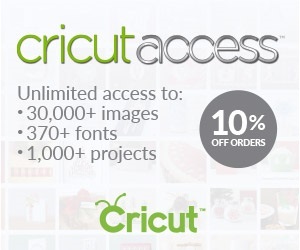 Sign up for Cricut Access™ and get unlimited access to images, fonts and projects today! Here we are, two weeks into the new year and people are getting back into the regular routines of life. For me, it is into a new routine of writing my blogs full-time. 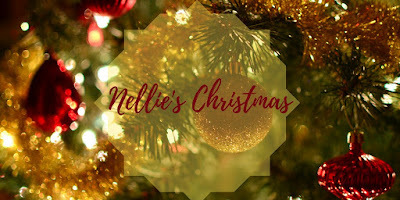 I'm finding there is a great community of bloggers out there where I can find support and suggestions on how to keep things on track. I have also found a community of blogging homeschoolers, many who travel and "roadschool" as we will be doing for much of the next year. There are a few things I've discovered in getting ready for our latest trip. A, there are a lot of things to pack for an eight-year-old who homeschools and B, my mother was an amazing woman. There were times in my childhood when our family travelled where it wasn't practical for us to attend a bricks and mortar school. When this happened, our mom took over our teaching duties and made sure we didn't fall behind. She did a wonderful job and even helped me stay ahead of my grade. I wonder how she managed to pack all of the books and things required into our 1971 Town and Country station wagon and still have room for luggage! This was before the time of ebooks and email so she had to carry along our textbooks and readers plus pens, pencils, notebooks...you get the picture. I loved learning this way and benefitted from visiting historic sites, art galleries and National Parks in person; so much more meaningful than only reading about them in a book. 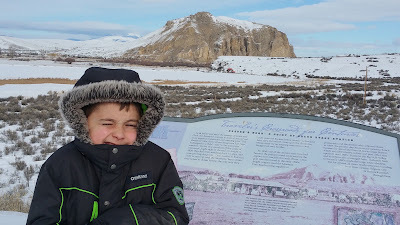 Our trip began in cold and snowy areas so we had to brave the elements as we drove along a portion of the Lewis and Clark Trail in Montana. Our grandson was fascinated and couldn't wait to learn more about their expedition. 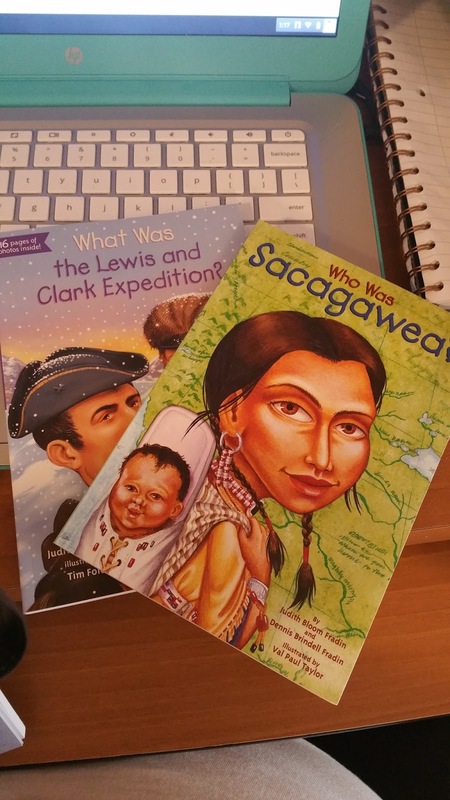 At one site the information boards talked of Sacagawea so she was added to the list of books to find. I really like the Grosser & Dunlap "Who was...?" and "What was...?" series. They are written at a grade 3-7 level so they are perfect for our needs and will be for some time. Picking them up at Barnes and Noble with my home educator discount makes them affordable plus the boy can look through the shelf and pick one for himself, always a treat. 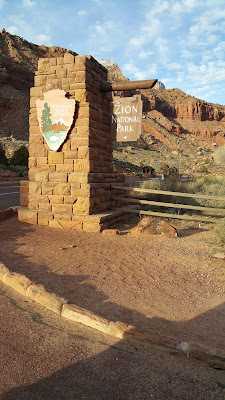 We continued on through Idaho and Utah and had a lovely drive through Zion National Park where we saw big horned sheep and wild turkeys along the side of the road. There was a lot of discussion about rocks and formations since this is something we are studying right now. We made sure to get our National Park passport stamped. We want to see how many we can get to in 2016, their centennial year. 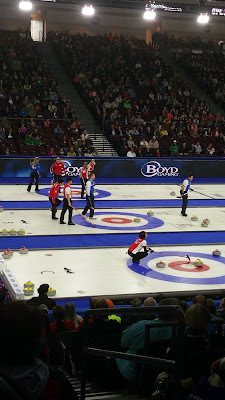 Our next stop was Las Vegas for the Continental Cup of curling. It seems a little odd to hold a curling event in a desert town but they put on a great show. We also spoke with some local curlers who are working to build a curling rink in Vegas. This way they can develop a junior program. Our grandson loves to curl in his local group and it's a great way for him to interact with other kids since he is homeschooled. After Las Vegas, we decided to travel on from there to the Tucson, Arizona area (warm weather, no snow!) There are a number of National Parks here that offer Junior Ranger programs that fit in with school curriculum. Learning about things hands-on is always so much more fun, and memorable, than simply learning from a book. I treasure my childhood memories of visits to The White House, Stone Mountain and Kitty Hawk, to name just a few. I want our grandson to have these memories too. This week we also celebrated Martin Luther King Jr. Day. Again we were able to find a "Who was...?" 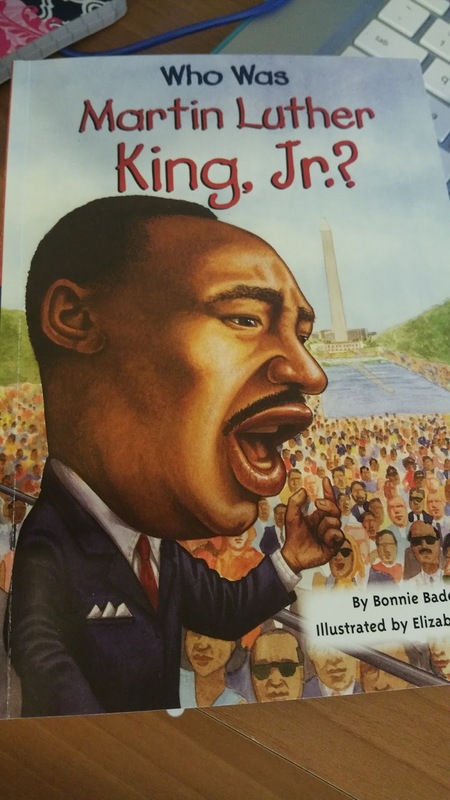 book that begins at the very beginning of MLK's life. It is fun for a child to see how an average little boy from a normal family can grow up to do great things. It is good to have role models and dreams. We've had a great start to our journey and look forward to travelling and learning as we travel North America, one highway at a time. The people of Alberta lost a friend last night. I lost a friend last night. Manmeet Singh Bhullar was a man who felt very deeply the importance of putting others ahead of himself. And last night he died as he had lived, helping others. Last night he was making the drive from Calgary to Edmonton in snowy Alberta weather, as he had done so many times before. But this time was different, this time as he selflessly stopped to help another motorist who had rolled into the median, Manmeet was struck by a semi-truck that had lost control. Despite being taken to hospital by ambulance, he succumbed to his injuries. News of his death sent a shock wave through social media. Friends and colleagues shared their grief. I cannot imagine the absolute deep sadness that his wife, Namrita, and his family are going through today. Manmeet lived in the same community as we did when our girls were young. He attended Chief Justice Milvain School with our daughters, only a couple of years ahead of our eldest. Later, I got to know him through his involvement in politics and community issues. He worked tirelessly with the young people in his community, first founding Calgary's Dashmesh Mission to support at-risk Sikh youth and then going on to help found the non-denominational Inspire Youth Development Society to provide support for youth in the broader community. He has always been a man with a strong sense of fairness. I remember a conversation we had several years ago, when he was still in his teens, about how he wanted to be a different kind of politician. He didn't want to be like some who enter politics with an eye to their own personal gain. No, Manmeet wanted to enter public life in order to help others. In particular, those who couldn't help themselves. He wanted to be their voice. And he was. As Minister of Human Services, he helped parents of children in care get back their voice. He worked to rewrite the law that banned them from speaking out when they felt they had been wronged and their child died as a result. No parent should have to go through this horror and only by hearing from people who have been through it can we change things so no one else has to know the pain of losing their child in a system that is there to protect their safety. Most recently, he was working to help Sikh and Hindu families in Afghanistan who are faced with religious discrimination and threats of violence on a daily basis. He spoke of children who have not been able to attend school for seven years. 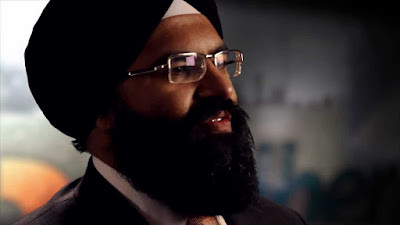 As he had always done, Manmeet continued to be an advocate for children and their families when he saw injustices being done. "Childhood/past Trauma is a major barrier to healthy relationships. The world needs more healing"
Yes, as we remember his kind and gentle ways over the next days, we will all need more healing.